Lion | Beer Apprentice - Craft Beer News, Reviews, Interviews and Info. Happy Thanksgiving!!!! I hope everyone’s day is going well. I don’t really have any kind of special beer to do for my Thanksgiving Day post, but I do want to reiterate how thankful I am to get to try so many different and wonderful craft beers. For today’s craft beer review I’m going to be sipping on a Lion Imperial Pilsner produced by Ceylon/Lion Brewery Limited located in Biyagama, Sri Lanka. 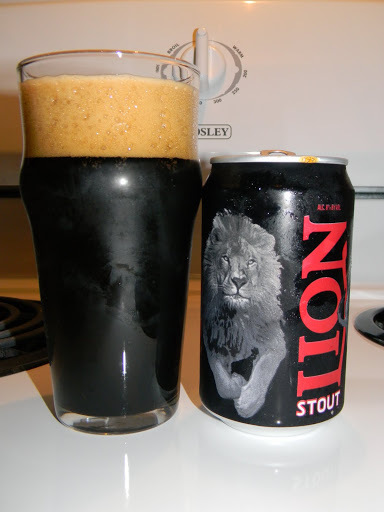 I have had the opportunity to try the Lion Imperial Stout and I thought it was a pretty darn good beer (plus it came in a can), so I’m hoping that this beer will rank right up there with it. The lionbeer.com website is under construction, so let’s turn to ratebeer.com to find the commercial description of this beer. Lion Imperial Lager from Sri Lanka is specially brewed to achieve its high alcohol content. The finest natural ingredients deliver a rich, smooth taste and refreshment. Enjoy its bite. This brew came in an 11.2 oz. bottle and had an ABV of 8.8%. The beer poured a semi-clear, honey/gold color with a somewhat soapy textured, white head. The size was ok, but the retention time could have been a little better I thought. The lacing seemed mostly average to me also. When held toward the light I could easily see some pleasant bright yellow highlights at the bottom of the glass. The aroma started with a whiff of alcohol. Something akin to a clear liquor. Deeper into the aroma I picked up on a nice little Spring flower type of note along with a sweet honey aroma. Distinguishable grains and breads helped push the bouquet along even more. The smell seemed balanced well enough, especially once it warmed a bit and the alcohol began to subside. The taste brought out a sweet honeysuckle savor along with a suitable malt crispness. Some white bread flavors mixed with breads and cereals and a significant alcohol distinction. I didn’t think the hops were very forthcoming, however a slight spiciness distracted me from the lack of hops for the most part. Not too bad here even though the alcohol was a little stronger than I typically like with my Pilsners. The mouthfeel was medium to medium/thin. Dry and crisp with a smooth alcohol warmth and burn. One thing that I noticed that I didn’t like was that it left an uncommon zing on the swallow that reminded me of getting a Novocaine shot. It felt very prickly and weird. That was somewhat off putting I thought. Other than that, it left quite a bit of flavor behind on the palate between sips. Well. This beer was ok. It was a little stronger on the alcohol front than what I usually find with most Pilsners. Now that’s not saying that it’s undrinkable or anything, but I would probably only want one of these during a sitting. The mouthfeel was a bit odd in my opinion, but the aroma and taste seemed alright. I’ll say that I believe I liked the Imperial Stout quite a bit more than I like this Imperial Pilsner. I think it would be worth a try for sure, but I, personally, may wait awhile before I pick it up again. Again, it’s not horrible or bad….. just a little different. Thanks for reading and commenting guys. I hope you all have a great Thanksgiving Day Weekend. Enjoy a tasty craft beer with that turkey and dressing!!! Until next time.